Part I of a four part series on great intranets. “Technology is just the enabler; people and process drive social business,” says Gloria Burke, Chief Knowledge Officer, Unisys. Unisys is a worldwide information technology company that provides a portfolio of IT services, software, and technology and more than 23,000 employees in more than 100 countries. The Unisys social intranet is an integrated intranet (built on Microsoft SharePoint 2010 and SharePoint 2013) that has evolved over time with the Unisys population. And although the intranet has been supplemented with additional technology – including FAST, Sitrion (Newsgator), , Microsoft Lync, and Salesforce.com,) – to bring alive the native functionality found in SharePoint, Unisys has put the principal focus and effort into people and process, not technology. Reporting to the CIO, as Chief Knowledge Officer, Gloria Burke owns the intranet and chairs the Intranet Steering Committee, and a Knowledge & Collaboration Stakeholders Council with senior leaders from across the company — business units, HR, IT, legal, finance, marketing, global operations, and more. The Unisys home page features the standard elements including global navigation, search, feature stories and audienced news, and features executive blogs and federated video from its You-Tube channel. Employees can in fact choose the language of choice for navigating the Unisys intranet, Inside Unisys. My News is targeted specifically to the individual based on region and organization, and language preferences. Prior to becoming social, Unisys employees, for lack of a common internal collaborative platform, created a non-Unisys sponsored community on Yammer. This unsecure social network outside the company’s firewall, compromised Unisys privacy standards and presented a security risk in more ways than one. In fact, more than 1,800 Unisys employees were contributing to this community. The company quickly transformed its intranet to incorporate a community-based collaborative platform and employees migrated back behind the firewall. “If you don’t invest in these platforms, you will lose young talent to the competition,” says Burke, addressing the 2014 Intranet Global Forum at the University of Southern California in Los Angeles, CA. And so the move towards social began many years ago, but began with emphasis in 2010 with the introduction of SharePoint My Sites – personalized, individual profile sites that enable employee social networking. Leading the charge, as the above statistics reveal, are senior management who are very active users, and active champions. In fact, senior management uses an internal social community, a closed community “to run Unisys,” adds Burke. Ed Coleman, the CEO, blogs to employees in his own words (not a PR handler’s words) and uses the blog to engage employees in dialogue. And he truly leads the social change at Unisys: a video promoting the new intranet spends the opening minute featuring Coleman using and evangelizing the value of the intranet and enterprise social media. Unisys employees were encouraged to create profile pages that include skills and experience to create a company presence and to follow colleagues in order to develop a valuable knowledge sharing network. They were also encouraged to author blogs, share updates through microblogs, and join communities of interest to share and develop expertise. Employees are automatically alerted to blog postings and microblog postings on the newsfeeds on Inside Unisys. In addition to its global newsfeed capability, Unisys also deployed Salesforce,com to enable it salesforce to leverage a segmented “Chatter” feed within Inside Unisys to share information specific to client account management, market win best practices and essons learned in losses. Unisys executives reinforced the value of social collaboration at town hall meetings with employees around the world, and the knowledge solutions team followed up with education and training. The team created role-based scenarios for the adoption and use of the various social computing capabilities and socialized them through targeted communications, explaining how employees could leverage social collaboration to do their jobs better. Kudos – This section allows employees to recognize the valuable contributions of others. Recent Activity Feed – what I and others are doing. My Organization – This section provides a view of my peer colleagues, those to whom I report and employees who report up to me (People Soft streams into the My Site Profile). Expertise – This section showcases my area of expertise and is linked to search. When colleagues ask question and uses a #hashtag the topic, I am notified. Post Questions & Answers – Employees can pose and answer questions within the newsfeed with greater transparency and reach. The use of hash tags directs questions to experts who can then respond with the right answer in a real time environment. Filtered Newsfeed Viewing – This allows employees to view global posts, or post made by colleagues whom they are following or by communities to which they are subscribed. Add/Follow Colleagues – Enables employees to quickly build a valuable network by following colleagues and the information they share in the newsfeed. In addition to social profiles, the Unisys intranet has 470 designated subject matter experts who curate knowledge and provide essential mentoring to evolve employee skill sets and expertise. Experts are badged in search as well as in their respective profiles, enabling employees to quickly identify and engage with them at the time of need. Clearly, if it takes a village to raise a child, it takes an enterprise to raise a social intranet. The Unisys and other leading intranets will be featured in a special webinar, The Best Intranets, March 19, 2014 at 12:30pm EDT. Registration is free. 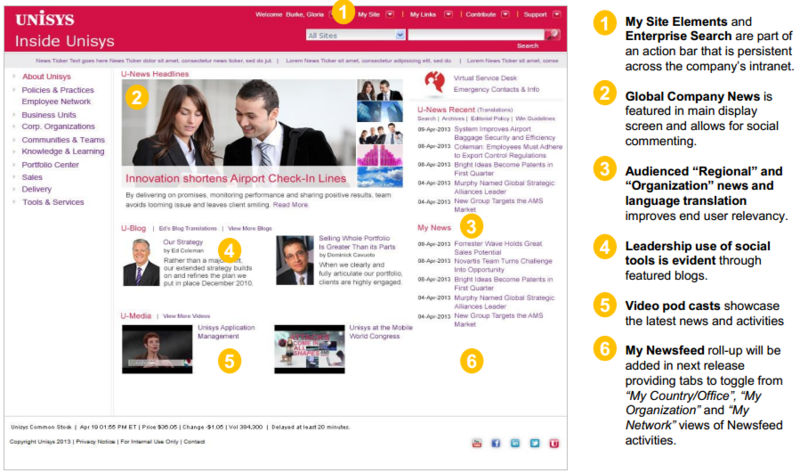 Part II of “Great Intranets” features the brilliant social intranet of Cisco, Great Intranets Part II: Cisco Systems. Toby Ward is the Founder and Chair of the Intranet Global Forum conferences, and CEO and Founder of Prescient Digital Media and Social Business Interactive. Toby’s global clients include Harvard, HSBC, Mastercard, Pepsi, Sony, USAA and dozens of others. This news blog is focused on intranets, website and social media strategy and is authored by Toby Ward, founder and CEO of Prescient Digital Media.